The Permian tree Glossopteris has had great importance for the development of the theory of continental drift. The Austrian geologist Eduard Suess was the first to suggest that all of today’s southern continents once formed a single large land mass. He based his theory on the discovery of Glossopteris on all of those continents. Similar fossil evidence concerning freshwater and land-dwelling reptiles, i.e. Mesosaurus and dicynodonts, subsequently confirmed Suess’ theory. Since none of the species involved is capable of traveling over open ocean, they must have spread to various parts of Gondwana when the continents were still joined together. 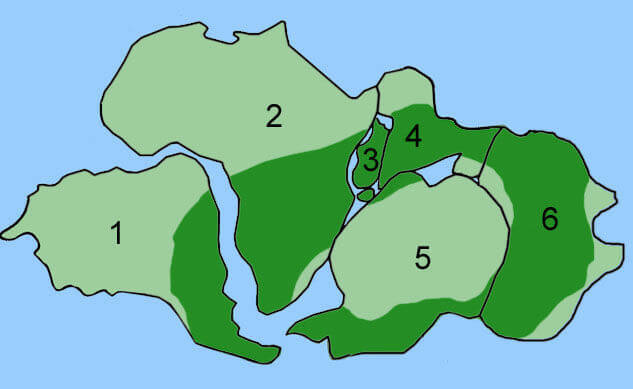 Distribution of Glossopteris. The map shows how the southern continents were once conjoined to form the supercontinent Gondwana. It also shows where fossils of Glossopteris have been found.